Clinical handover is the effective "transfer of professional responsibility and accountability for some or all aspects of care for a patient, or group of patients, to another person or professional group on a temporary or permanent basis" . Healthcare usually involves multiple health professionals over a variety of settings. A patient's care journey may begin with their general practitioner and follow on to a medical specialist, hospital and then home. At each transition of care, clinical handover should occur to ensure patient safety. The NSW Health Policy Clinical Handover - Standard Key Principles (PD2009_060) recognises the key principles of Leadership, Valuing handover, Handover participants, Handover time, Handover location, and Handover process. Patient and carer involvement that is included in these structured processes. The Clinical Excellence Commission has created a resource for the NSQHSS for clinicians to utilise when assessing their units against these standards. It provides essential criteria, actions and resources for each of the ten standards. As clinical handover is a routine process, it can be improved by the use of tools and techniques that standardise the process, while leaving room for situational variation. 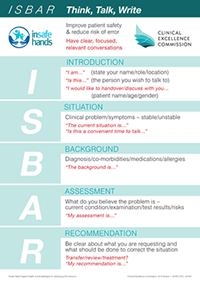 The CEC recommends the use of ISBAR as a communication tool for clinical handover. 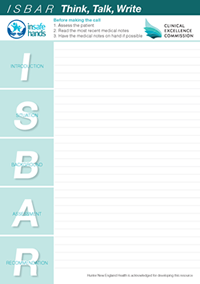 The South Australian Department of Health and Ageing and New South Wales Health have collaborated to develop the ISBAR iPhone/iPad application. The app is designed to provide clinical handover prompts for a variety of clinical handovers and allows free form input to enable clinicians to develop individual handover prompts for other specialties. No patient information is stored in the app. 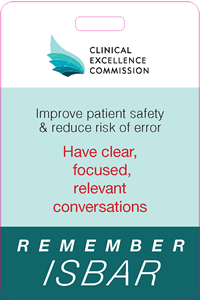 It provides a guide to help ensure that essential information is not missed, supporting continuity of care and error prevention. Haikerwal, Dobb, Ahmed, 2006, Safe Handover: Safe Patients - Guidance on Clinical Handover for Clinicians and Managers, Australian Medical Association Limited.